Today we had a lovely day. 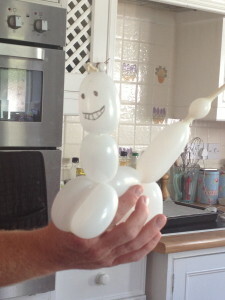 I made balloon animals in the morning. As you do. 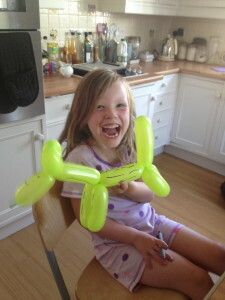 I was rather good at dogs. Him indoors was less good. His was a ‘robo dog’ apparently. Then I went for a run. It was a very good run. 10.6k, quite hilly but average 8.36 min/mile so I was quite happy. Then we went to a beautiful spot in the Surrey countryside famous for it’s cycling route. The girls were a bit hyper. I sat back, ate my sandwiches and watched Daddy get jumped on numerous times. He’s far too nice to tell them to stop. now this sounds like a good day to me! 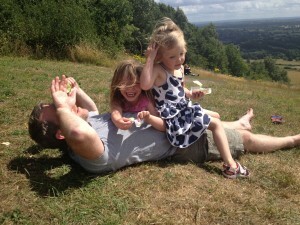 I definatley go out and about more since having kids!